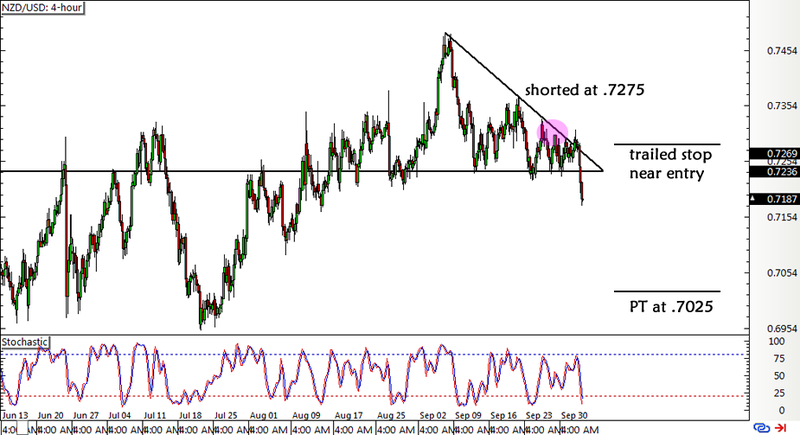 The Kiwi seems to be showing more downside momentum so I’m making a few adjustments to protect my profits on this NZD/USD short trade. Whee! In my initial trade setup, I decided to hop in on a quick pullback after price made a break below its rising wedge support. Price continued to consolidate between .7250 to .7300 after that so I was a bit worried that Kiwi bears are losing steam. I spotted a small descending triangle pattern on the 4-hour chart so I decided that I would cut my losses if price broke to the upside and keep my short position open if it broke lower. Fortunately for my trade, New Zealand’s latest GDT auction showed a 3% fall in dairy prices, capping off its recent streak of gains and signaling that the industry might not be out of the woods just yet. Meanwhile, the Greenback has been enjoying a lot of support from the pickup in risk aversion owing to the revival of Brexit jitters. Apart from that, leading jobs indicators have been coming in better than expected, keeping hopes up for an upbeat NFP release and a potential Fed rate hike before the end of the year. Price has moved nearly a hundred pips in my trade’s favor so I’ve decided to roll my stop just slightly below entry at .7250 to lock in some profits. I’ve still got my sights set on the .7000 area for my profit target, and it seems that fundamentals favor more losses for this pair. I’m also considering adding to my position to press my advantage, but I’d rather wait for the next set of U.S. reports first.